The Olympic tournament in Rio will be the “last dance” for one of the world’s right wings – Radmila Petrovic. The 28-years old lefthander who spent a whole career at ZRK Buducnost Podgorica, decided to give an advantage to family life after Olympic Games next summer. Petrovic was a part of all major success of ZRK Buducnost, but also Montenegrian national team. 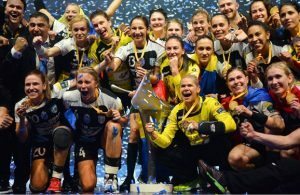 She won the Women’s EHF Champions League twice (2012 and 2015), but also European gold and Olympic silver medal with NT in 2012. ← Previous Story Budapest celebrate Beach Handball this summer. draw on Thursday!